As I mentioned in my last newsletter, Jeanne was in charge of the children's tracks at BASS. She saw the potential in me and encouraged me to lead workshops. Her secret of helping so many Christians grow is to patiently listen to their dreams, fears and doubts. How can you help someone without first showing them that you understand and accept them just the way they are? Every year, I ran into Jeanne at BASS. Most of the time, we could only exchange brief sentences before heading different directions. One year, she came into my classroom (even though I was teaching a workshop in the Asian track) and asked how I was doing. I knew she was busy, but she lingered on to listen, even long enough for James to take a photo. On March 2, 2014, James and I attended the memorial service of Jeannie Stenfort. The sanctuary was packed, and so was the gym at the reception following the service. Jeanne loved and she was well-loved. Jeanne and her husband were married in 1962, and they had four children and nine grandchildren. At the beginning of the service, a few of her grandchildren played a piano prelude. Three of her grandchildren read her eulogy. Her first experience in CEF was in 1972 with 5 Day Clubs, and she started weekly Good News Club in her home. 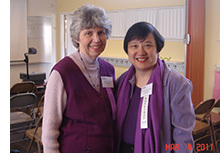 She continued with this work and became the CEF Director of Silicon Valley in 1983. Not only did she teach children at CEF clubs and at her church (her favorite age to teach at church was the kindergartners), she also trained teachers to teach. Everyone knows her work and passion for children receiving Christ as their personal savior. In 2004, she received the National CEF President's Award in recognition for outstanding achievement in the ministry of CEF. "Mom demonstrates patience, faithfulness, and peace every day in our home." "She was a soft-spoken leader." "Jeanne saw potentials in people." "Jeanne taught and exemplified that (1) she loves God. (2) She loves her neighbors as herself. (3) How to suffer with grace (when she was battling cancer for the last six years)." "Jeanne saw God-given abilities in people." "My wife's priority is God, her devotion, CEF, and our family!" "Jeanne is my hero! I have watched (1) Her unfailing love of her husband -- he could do no wrong in her eyes -- and her family. (2) Her unfailing commitment to the Lord by taking on challenges and leadership roles, even though she was a shy and retiring person by nature. (3) Her commitment to children and passion to lead them to the Lord." "Jeanne has showed us that time is precious and only what is done for Christ will count. She never complained and never stopped working!"